A senior aide to Israeli Prime Minister Benjamin Netanyahu says he is taking a leave of absence following a series of sexual misconduct allegations. David Keyes said he wanted to clear his name from “false and misleading accusations”. The Times of Israel says that 12 women have accused him of inappropriate behaviour. One of them, New York State Senate candidate Julia Salazar, accused him publicly of sexual assault on Tuesday. Wall Street Journal reporter Shayndi Raice later wrote on Twitter that she, too, had had “a terrible encounter” with Mr Keyes. The other 10 women have asked to remain anonymous, the Israeli newspaper reported. In a statement on Thursday, Mr Keyes, 34, said he was “fully confident that the truth will come out”. “In light of the false and misleading accusations against me and in order not to distract from the important work of the prime minister, I have asked to take time off to clear my name,” he said. The Times of Israel says the allegations took place before Mr Keyes was appointed Mr Netanyahu’s foreign media spokesman in 2016. It quotes sources as saying that Mr Keyes had been asked to stay away from certain offices in New York because of his behaviour. The prime minister’s office said it had accepted Mr Keyes’ request to take time off, the newspaper added. She accused Mr Keyes of having “absolutely no conception of the word ‘no'” and described him as a “predator”. 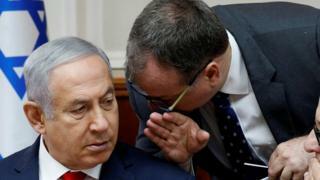 On Thursday, several Israeli politicians called on Mr Netanyahu to suspend Mr Keyes until the reports could be clarified.